Nissan is hoping charging stations will help charge sales of the Leaf, pictured, on the West Coast. The West Coast Electric Highway is now online in Washington state. The Washington State Department of Transportation and partner AeroVironment, a Monrovia, Calif.-based company that builds electric charging stations, opened seven stations last week along Interstate 5 and three on U.S. Route 2. 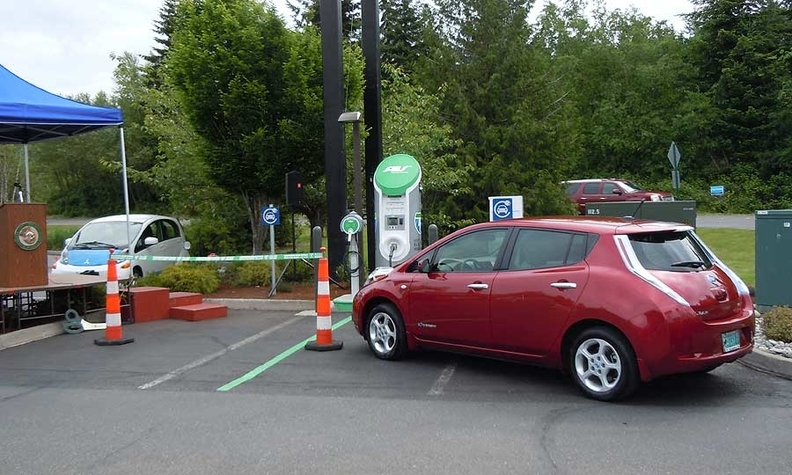 Electric-vehicle drivers can charge up on I-5 in Blaine, Bellingham, Burlington, Tumwater, Centralia, Ridgefield and Vancouver while Sultan, Skykomish and Leavenworth provide charging opportunities on U.S. 2. According to Washington’s transportation department, 70 percent of the state’s population lives within 16 miles of I-5. Several stations opened in Oregon in March, and the goal is to have charging units located every 25 to 60 miles along I-5 for 1,300 miles from the Canadian border through California, according to the department. The U.S. Department of Energy provided $1.5 million through federal stimulus funds for the project. Eight of the 10 sites, excluding Blaine and Vancouver, feature both DC fast chargers that can replenish nearly depleted batteries in about 30 minutes and Level 2 chargers that take a few hours. The Blaine and Vancouver stations have only Level 2 units. Automakers are paying attention to the highway. Mark Perry, Nissan America’s director of product planning, said the company had a “consulting role” during the planning stages such as providing the areas where owners of the electric Nissan Leaf reside. He said there are 12,000 Leafs on the road nationwide. Last month, 510 Leafs were sold in the U.S. market, down 55 percent from 1,142 in May 2011. Through five months, Leaf sales were tracking 21 percent higher than in 2011 with 2,613 units. The electric hatchbacks can travel about 73 miles on a single charge. To make the Leaf more accessible to consumers, Nissan is offering a special lease program in which they can pay $289 a month after placing $2,999 down, Perry said. One of the ideal uses of the highway, he said, is for drivers to make the busy, 35-mile commute from Seattle to Tacoma, Wash., on battery power. He also said the stretch is great for recreational users since the stations are strategically placed near beaches and other entertainment spots. If Leaf drivers don’t need to travel far, they can make a quick 10-minute pit stop on a fast charger to add 30 miles of range instead of waiting for a full charge, he said. Michelle Malcho, communications manager for the Chevrolet Volt plug-in hybrid sedan, said the company has Volt ride-and-drive programs in Seattle and Portland. She said 80 percent of Americans drive 40 miles or fewer each day, so the highway is an “important step forward” for electric-vehicle owners with shorter commutes. The Volt can travel about 40 miles on its battery alone and 379 miles if it has a full tank of gasoline and a maxed-out battery, she said. Sales of the Volt rose 249 percent in May from a year ago, to 1,680 units from 481. For the first five months, 7,057 Volts have been sold, a 223 percent increase over last year’s 2,184 units. Drivers will be able to access the charging units with key cards they can get by signing up on AeroVironment’s Charging Network at evsolutions.com/avnetwork or by calling toll free at 888-833-2148. People can use the charging stations for free during the introductory phase, Wong said. AeroVironment hasn’t decided how long that phase will be or what the ultimate price for charging will be. “We want drivers to get used to knowing they’re there,” he said.